There is something magical about baked Alaska. Break through the crisp shell of marshmallow-like meringue straight from the oven, then tuck into still-cold ice cream, mingled with sticky sauce and chocolate brownie. Who can resist? Preheat the oven to 230ºC, gas mark 8. Place the brownies in the base of an ovenproof dessert dish (one in which they will fit snugly) and pour the chocolate sauce over. Top with the ice cream and return to the freezer to keep cold. 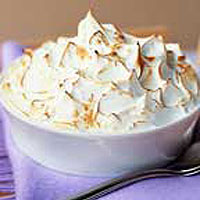 Whisk the egg whites to stiff peaks, whisk in half the sugar until glossy, then carefully fold in the remaining sugar. Remove the dish from the freezer and pile the meringue mixture over the ice cream, making sure there are no gaps and the ice cream is thoroughly covered. Place the bowl in the preheated oven for 3-4 minutes, or until the meringue is tinged with golden peaks, taking care not to let it burn. Serve immediately.